The manual is placed in the “Play Books” app, which is handy as no paper manual is included. As you can also see on the home screen, you get the movie “Transformers – Dark of the Moon” and Jeffery Archer’s “Only Time Will Tell” eBook free, included with the device. After setting up with the Google account, a £15 voucher is also deposited into your Google Play account (if the offer was valid when the device was ordered), to spend on apps or games etc. Performance is the first thing I wanted to check and having a movie readily available to run, made it easy to do a quick test. Admittedly, it’s not the heaviest of content or particularly taxing on the processor/graphics, but it gave a good indication of its capabilities by running smoothly and sound was as good as you could expect from a small tablet. I’ll probably try to test some games on it and hopefully they’ll run fine too. After a few minutes, you may find that it downloaded an update in the background and wants to run it. In my case, I ran it immediately (you don’t have to) which not only updated the device but also a couple of applications on it. The device rebooted after the update and the process was smooth. After the update, the version becomes 4.1.1. One well-known annoyance is that Adobe Flash is not supported so content that uses it, doesn’t run on this device. The BBC website is one example (at the time of writing), none of the iPlayer clips ran and while it offers the link to Google Play for installation, once there, a banner informs you that Adobe Flash is not supported. So, no luck there. That said, browsing websites in general is pretty responsive and smooth. There aren’t many applications or widgets built-in but I guess, that’s where you would like to spend your £15 voucher 🙂 There is built-in NFC and is switched on but as I don’t have any other device with NFC, I couldn’t play with it. At the moment, the only use case seems to be exchange of data like web pages, contacts, videos etc. with other NFC-enabled devices. Maybe Google Wallet will make good use of it when available (in the UK). I haven’t had a chance to completely drain the battery yet but after a few hours of normal use (no movies etc. – just playing with various options/apps), it still has over 70% of it remaining. That’s pretty good considering I’ve been using it constantly for more than three hours now. I think this makes Nexus 7 a good option as an eBook reader (if you’re not mad about E Ink, that is). Update (31/07/2012 0900 BST): My missus loved it so much that she bought one for her business. Google is shipping them super fast too. It was ordered on Sunday night and has just been delivered – early Tuesday morning! You’re lucky that your missus got it up and running, hope she managed to open it OK (apparently its a struggle!). 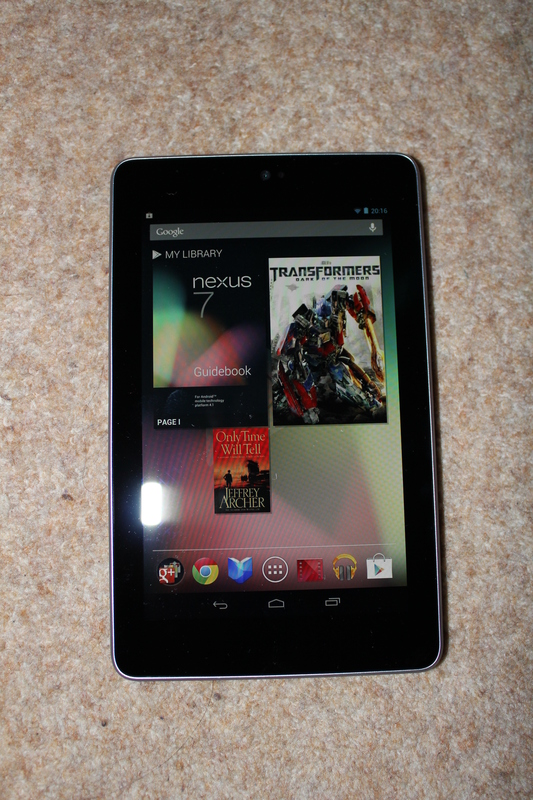 I look forward to unleashing my two year old on my Nexus when it arrives – I think he’s going to love it! Being quite tightly-packed, I agree it’s a bit of a struggle! It sort of air-locks inside so full marks to the missus. 🙂 I am sure your two-year old will love it as I found the display to be quite responsive and there are quite a few interesting games/activity apps out there. Good choice for that as it’s not too expensive either! Thanks for the review. 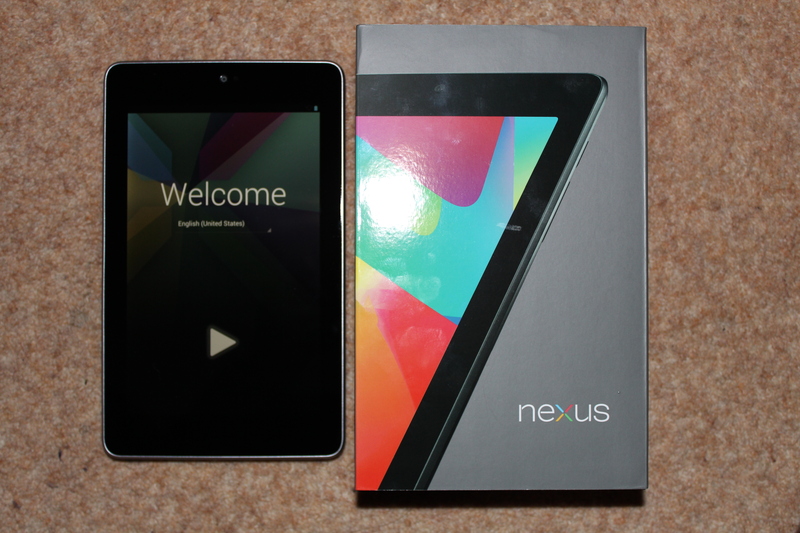 I read this the day I received our Nexus 7. So when I got home I knew what to expect 🙂 I also found it a bit of a struggle to open! Very tightly packed, but not a bad thing. Battery life has been great for me, even after an hour or so of intense gaming over the weekend. @ Ather: No doubt it is a pretty impressive gadget and our 5 year old son is looking forward to get one on his birthday. He is determined to save all his money for this :-), Bless him. All in all, a very impressive product and I’ve already really taken to the 7-inch form factor. Good to hear from you! I am thinking of getting one for myself too but I am probably going to wait for a bit and see when/what Microsoft Surface offers as that fits in with my style of working a bit better. The only annoyance so far is lack of Flash (due to tech blog videos etc.) but then I don’t mind that as much due to the issues it generally has and the fact that I mostly have workarounds. You are right, we don’t mind especially when we find some alternative. Just like our daughter who was so desperate to listen to “Hearts Radio” that she found an app for that and is the happiest girl in the world. Now she can’t miss her Top 40 on Sundays, can she? Just got mine and, well, can I say that I’m disgusted with the fact they preloaded it with a Jeffrey Archer novel.